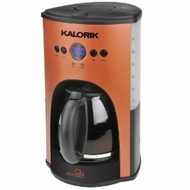 1000 Watt Large 12-cup capacity with LCD display which has a blue backlight. Fully programmable with timer and LCD display. Features a pause and serve and 2 hours auto shut-off function function.